The bare bones truth is, that there were no stretchers. It was plain unvarnished veracity. Undiluted reality, nothing like the hype that passes for 'reality' TV, much more honest and true than that: no script, no gaggle of cameramen, no sound guys, and none of those guys in black jeans and T-shirts carrying giant white parasols around. No mirrors, just the smoke lingering in the meat, and truth, and nothing but the truth. And yet you wonder. A sandwich, so good, so tempting, that it can instantly break the most resolute vow of lenten or ramadan fasting and abstinence? Lure expats back to the city begging for more? No way! Hold the phone my dear skeptics. I have more incontrovertible evidence to offer. I'm talking about media frenzy, high stakes foreign-affairs-level, international-incident, front-page, stop-the-presses stuff. Really! Before I proceed with my big reveal, I propose a little mouth-watering digression to the acme, the temple, the pinnacle, the shrine, the capitol, the parthenon, the pyramid, the stonehenge, the very holy of holies, of smoked meat. How could I leave Montreal without a lunchtime pilgrimage? After all, it's not like ascending the steps of St-Joseph's Oratory on your knees, or covering the Camino de Santiago on foot all the way through France and Spain, or doing a Hajj to Mecca. It's just lunch. Or is it? The undeniable fact is that Smoke Meat Pete is an immersive experience. 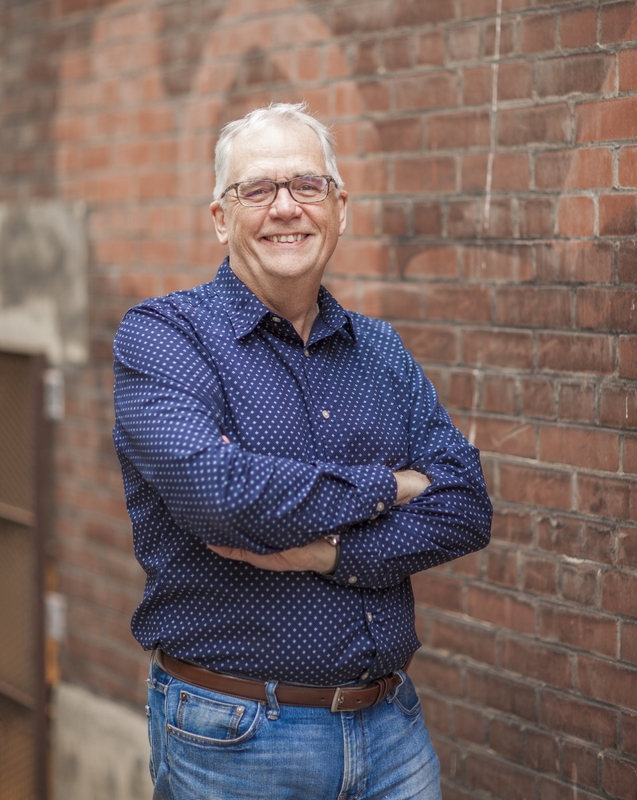 I ordered a special (smoked meat sandwich, fries, cole slaw, pickle spears, and a black cherry soda), settled into a booth and took in my surroundings, thinking back to many years ago when Pete Varvaro opened up a tiny microscopic sandwich counter in a basement a stone's throw from the present location. ... yes that's right, the blues. At the moment it was recorded blues that was playing on the restaurant's sound system but come the evening, live blues, for the price of a special, right there on the bandstand in the corner. If there's one thing that moves Pete's soul almost as much as producing what I sincerely believe is the best smoked meat in the metropolis (and therefore the known universe), it's the blues. I suppose that I find this more compelling than someone whose musical tastes don't flow in the direction of the blues, but oh dear lord, this is about as good as it gets for me in terms of an intersection of delicious smells, mouth watering tastes and soul satisfying sounds. The most incredible sensual trifecta. In no time I heard my name called. I raised my hand and motioned my lunch over to my booth. As a popular Canadian Food Network TV show states as its mantra, you gotta eat here! All that, and you're still wondering, aren't you? Last week (what a coincidence! ), I pick up the morning paper and am not surprised that there is copious coverage of Prime Minister Trudeau's state visit to Washington. It was no surprise that there was a gala at the White House attended by hordes of glitterati and that there were other receptions in honor of our heartthrob PM. 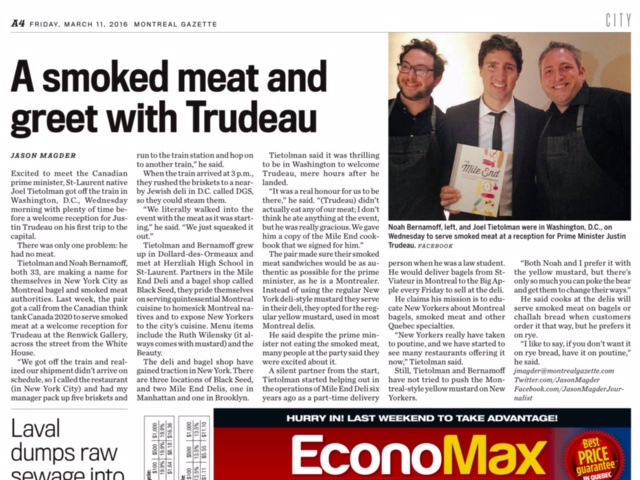 But it was a surprise to see that one of those state dinners featured... Montreal smoked meat. The purveyors of that smoked meat brought it in from their restaurant in New York City. That's right, Montreal expats have introduced New Yorkers to Montreal Smoked Meat. 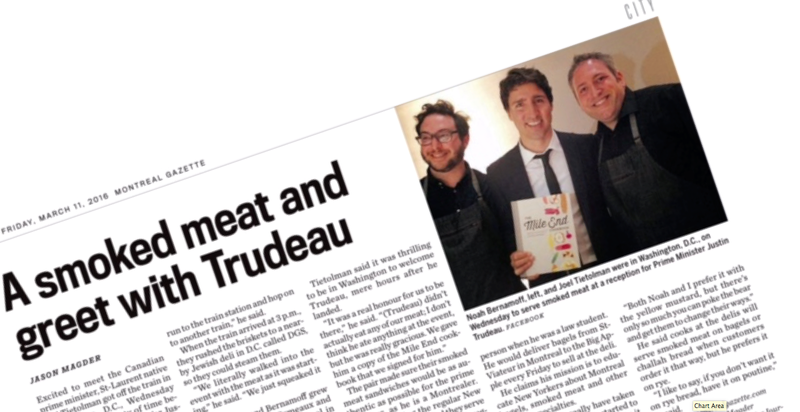 Not only that, but they have published a cookbook that reveals the secrets of Montreal's most iconic dish, and they gave the Prime Minister a signed copy. In another weird coincidence, as Susan and I were running errands on the very morning when that news story appeared in the Montreal Gazette (you will find a better image of the article below), we stumbled on the very same book for sale in Sears of all places. If you are curious, you can pick it up on Amazon. The book is named for Montreal's Mile End neighborhood just north of the Plateau where Montreal smoked meat was born. The Mile End is another neighborhood surrounding the Maine defined by successive waves of immigration. I feel like I've become an illuminated being, sitting here reading (and almost drooling) about smoked meat while I eat my shredded wheat cereal with blueberries and skim milk. Since my heart attack I've been trained on the dangers of most meats. Since then there has been almost no meat save for lean turkey or chicken -- a pale substitute for bacon and other smoked meats. Watched the movie "Little Buddha" yesterday. More "no meat' going on there too. It's nice to dream a little on a cold morning about a Smoked Pete experience. Thanks for that! Yes David, you are indeed a foodie of the highest order! Unfortunately more gourmand than gourmet. I am pretty sure that you are going to miss all these eclectic food places in Montreal. True, but I will have a lot of fun finding all the great little gems in Toronto. You should find one you like. I shall expect when I am in Toronto in late June to eat meat such as that found in that very establishment in Montreal. And everyone shall speak English. And the loonie will be feeble. And life will be good.